La Otra Orilla was back at Verdun’s Maison de la culture from January 14th to 20th to design and stage 40 minutes of MAGNETIKAE. A significant breakthrough in creation. The team worked on dance, music, lights, sound, costumes and set, to bring together a short version that will premiere in Calgary in April-May. We once again thanks the team of Quai 5160 for its warm welcome! Miguel Medina is a musician and percussionist. Following his studies in composition and classical percussion at Manuel M. Ponce Conservatory in Mexico, Miguel Medina worked for three years with choreographer and director Ruben Segal of Barcelona. Since nine-year-old he is musician for contemporary dance at Concordia University and the Montreal School of Contemporary Dance, he has also worked in numerous musical projects in Mexico, France and Canada. Notably El Azote, Juan Carranza, Gitan Blues, Sarah Renelik, Malade Mantra, Spanish Flamenco Arte Ballet Company, SaSaSa Company, Jorge Martinez, La Otra Orilla and the composer guitarist Caroline Planté. He is also a director and editor of different short films (Rhizome Films). After studying at Conservatoire de musique de Montréal in André Laplante's class and at Indiana University with Menahem Pressler, Gaël Lane Lépine is pursuing a career as a composer, performer and teacher. Since 2012, he has collaborated with many Montreal theatre productions as music and sound designer, with artists from different fields such as Catherine Dorion, Benoît Vermeulen, Navet Confit, and has performed within projects of Lewis Furey and Yan England, to name a few. Gaël also is musical director of the theatre program at Lionel-Groulx College. MAGNETIKAE is his second collaboration with La Otra Orilla compagnie, as sound designer and performer, after The place in between in 2016. La Otra Orilla spent the intense week of Cinars Biennale in beautiful Arsenal contemporary art gallery, presenting 3 showcases within the off Cinars, and one public presentation of the work in progress within the TD Cultural Tuesdays program. The first 25 minutes of the work in progress were tested as well as prototypes of the costumes. We thank Danse Danse and l'Arsenal for this week long residence. Graduated from the National Theatre School of Canada (2008), she is a costume designer mainly in theatre, dance, opera and musicals. Her work can be seen in many productions such as: Cosi Fan Tutte (François Racine, 2008), l'Opéra de 4'sous (TNM, Robert Bellefeuille, 2010), Le Petit Roi (Juste pour Rire, Serge Postigo, 2011), Le Rêve de Grégoire (Chants libres, René Daniel Dubois, 2014), among others. She also works with Ottawa's youth theatre La Vieille 17 and Montreal's Le Théâtre Magasin. MAGNETIKAE is her third collaboration with La Otra Orilla, after Moi&lesAutres (2015) and the place in between (2016). MAGNETIKAE was on the road in October for it's first showcase! La Otra Orilla presented an excerpt of the work in progress at Ryerson Theatre Toronto, October 4th 2018, during FFDN's International Presenters' Program. The ice is broken! On tour at FFDN 2018: Myriam Allard, Hedi Graja, Gaël Lane Lépine, Miguel Medina (performers), Philippe Pelletier and Pierre-Luc Brunet (sound and lights), and Adeline Silva (communications). From August 26th to August 31st, La Otra Orilla had it's first residence in a theatre for MAGNETIKAE, at Verdun's brand new Maison de la culture. 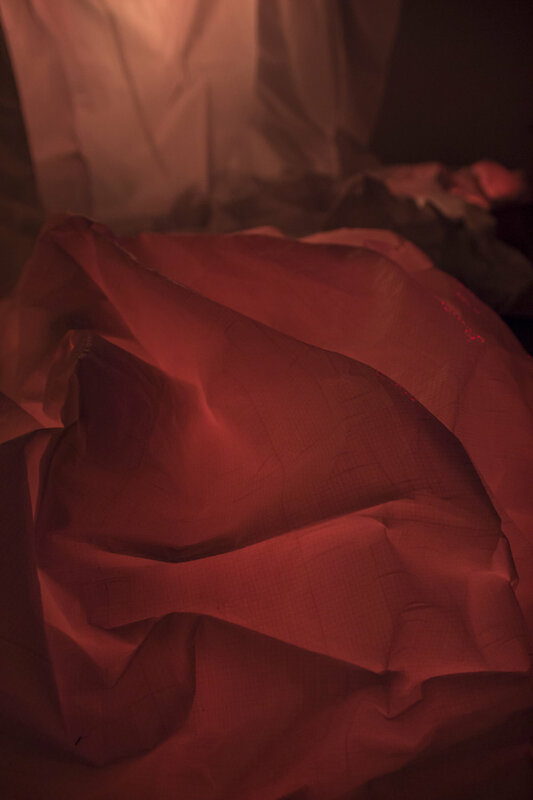 Hedi Graja worked on the set and Julie Basse on lights, both making first drafts so as to start building the aesthetic of the show, while the performers rehearsed. We are extremely thankful to Quai 5160's team for the warm welcome and look forward to our second residence in that beautiful space in January. Lilek yasser fil frejdaire ? * have you lived in the fridge long ? I was reminded of the words and the tragic expression on the face of that African compatriot who I met one February day and who told me that this Montreal winter would be the last in a four-year exile that was finally coming to a close. The North had shaken him, thrown him off balance by first troubling his senses. The cold, a chapping of the skin, the organs, and finally the spirit like a slow numbing. He no longer recognized himself and waited, resigned, for the uncertain hour of his deliverance. Uprooting, deprivation on a piece of an ice floe set adrift. Interior landscapes—do we traverse landscapes or are we traversed by them? Spaces that we pass through and lands that pass through us, knock us over, then inhabit us. The virgin page, this snow bank in which the foot sinks and footprints erased from the icy ground. A great whitewashing. A passage via the pole, magnetic.